The Meat And Nuts Breakfast – Why Is It So Awesome? The meat-and-nuts breakfasts is one of the very best, if not the best, breakfast for changing your physique! “Breakfast is the most important meal of the day!” – signed, Everyone. You’ve all heard it a million times. Is breakfast really the most important meal of the day? This isn’t a debate whether or not breakfast is of the utmost importance, or if starting the day in a fasted state is better for your metabolic furnace to ramp up. Rather, this article will try and beat it into your heads why the meat-and-nuts breakfast is an amazing breakfast for changing your physique, as well as being focused and energized throughout the day. So What is the Meat and Nuts Breakfast? One can search far and wide about the meat-and-nuts breakfast, and find tons of useful info on it, but we found a pretty good, straightforward article on BodyBuilding.com detailing this breakfast plan, and it even has a sample menu for you! We’ve all heard people say that breakfast is the most important meal of the day. Lost in that simple saying, though, is what exactly is on the plate or in the bowl—i.e., if it’s a proper breakfast. “Proper” of course is dependent upon your goals, but I’m going to take a fitness tack here and assume that your goals are, in no particular order, feeling your best and looking your best. Sound about right? Why Does the Meat and Nuts Breakfast Work? The meat-and-nuts breakfast contains 2 awesome things: meat and nuts. Easy enough, right? But why is eating meat and nuts early in the morning so good for us? Let’s look at it by separating the 2 foods. First, meat gives us power. Rather, the protein, amino acids, and iron does. Not just any power, but sustained power which lasts and lasts. The secret is that meat, due to its high protein content, creates a gradual blood sugar increase throughout the day. Sugar and other simple carbs may give you a quick boost, but their lack of protein means that good feeling won’t last. Next, let’s talk about nuts (insert perverted joke here). Nuts are known for stabilizing blood sugar in the human body. Nuts are great sources of healthy, lean fats, and they keep your blood sugar at stable levels for long periods. 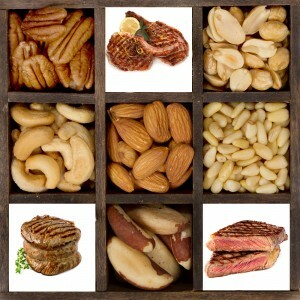 Nuts are wonderful sources of healthy fats that help your body maintain the blood sugar level stable for long periods. Whew! That was alot simpler than anticipated. So what exactly happens when you combine these 2 great facts into a morning meal? Pure awesomeness, that’s what! You get a high dose of protein and power in the morning, combined with healthy fats for a feeling of satiety that lasts and lasts. The meat-and-nuts breakfast keeps you full, sharp, and focused, and it sets up your fat burning mechanisms for the remainder of the day. Not too shabby! Variety is the Spice of Breakfast! You might be thinking that you’ll get sick of eating the same stuff over and over again. Not to mention eating slabs of meat and nuts first thing in the morning is not appetizing to most. Well, the only thing I can say to that is… too bad! This way of eating breakfast is awesome, and it should be implemented if you want to make serious physique changes, men and women alike! It is alot easier than you think in varying your meats and nuts for consumption. Rotate a few meat sources through your diet for variety: alligator, buffalo, black bear, elk, kangaroo, ostrich, venison, wagyu, wild boar, and yak. If poultry is more your thing, try duck, goose, guinea fowl, pheasant, quail, and squab. You may not have heard of all of them, but somebody in your city probably has. Check ethnic markets and butcher shops, and keep an open mind. You won’t have to search nearly so far to track down a variety of nuts. Pretty much any store will carry at least seven varieties, such as almonds, cashews, Brazil nuts, macadamia nuts, hazelnuts, pecans, and walnuts. They can get expensive, but once you’ve got your price radar working you can buy in bulk and store up.